Creating recycled art from discarded materials for over 50 years. Dwell magazine, March 2011 issue has a piece on Ada Louise Huxtable – the famous architecture critic – in honor of her 90th birthday. 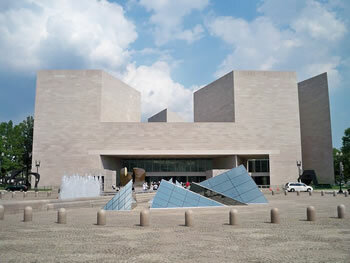 The piece mentions Huxtable’s review of the East Wing of the National Gallery of Art, “a great building for all time.” This building was done by I.M. Pei, and I was assigned to work on this commission. The East Wing of the National Gallery was one of my first major jobs at I.M. Pei. I was responsible for making the drawings for the carpenter of the structure of the model. The carpenter was a very good Italian craftsman named Frank Ardito. This was a three-eighth scale model. When it was finished it was in a special room, the model was 20 feet long and 16 feet wide. The last I heard of the model it was in the National Gallery and was being used to plan exhibits to see the placement of art. The building has a very acute 19 degree angle. This was a good job for a woodworker because the angle is so acute you have to cut very involved miters. The nodes for the skylight were very involved and we had to cast these for the model out of acrylic. We had to make special furniture and figures for the model. It was a very involved project. They spent about $200,000 in the making of the model. Alexander Calder, the famous sculptor, came to our shop to hang his a model of his mobile in the building model to see what it would look like in the final building. He was a very nice man and shook everyones hand. The President of France at the time, Francois Miterand, saw the finished building and was so impressed he decided that Pei should re-design parts of the Louvre. I’ve used some leftover parts of the model in some of my own acrylic boxes. Ada, you look great at 90 years young!